In my neurotic holiday menu planning mind, no holiday celebration would be complete without a killer cheesecake. Now, for the past 4 years, I have lived and breathed for the tall and creamy cheesecake. For a “plain” cheesecake, there is no comparison whatsoever! It’s perfect!! But I think I’ve scared Kyle this year. I’ve taken away his security of the tall and creamy and replaced it with two other cheesecakes this holiday season. There has been no inkling of disappointment though. This cappuccino fudge cheesecake is completely over the top. Its chocolate cookie crust is covered with a layer of fudgy ganache followed by a smooth cappuccino cheesecake filling and a sour cream topping. And then some extra ganache and chocolate-covered espresso beans are added to pretty the whole thing up. Even with the thinnest of slices – I cut 1-inch slices – you’ll need plenty of extra room in your belly to handle this cheesecake. Or plenty of friends to share it with! If you’re a coffee- or cappuccino-anything lover like my entire family is, you cannot possibly go wrong with this cappuccino fudge cheesecake. If you choose to make your own wafer cookies, use only 5 tablespoons of butter in the crust recipe. The cookies themselves contain plenty of butter on their own and an additional 7 tablespoons of melted butter yields a very wet crust. This cheesecake takes a while to put together (not unlike any other cheesecake) so plan accordingly. You’ll need at approximately 2 ½ hours of initial prep and bake time and 3 hours in the fridge to chill, then an additional 6 hours (minimum) to fully chill and set once you’ve added the ganache decorations. You can make this cheesecake up to 2 days in advance, keeping it well-covered and chilled. I had quite a bit of trouble with the top 1 – 2 inches of crust completely separating from the top of the cheesecake (i.e., it fell off) and I think this was caused by there being too much butter in the crust so I’ve adjusted the recipe below. Thankfully, I had some extra ganache leftover to attempt to cover my sins, post-complete freak out period, of course. It’s all worth it though – trust me. I didn’t take any photos of the inside of the cheesecake because I brought it to Thanksgiving dinner at my brother’s house but Smitten Kitchen has some great photos posted (link below). To make the crust: In the bowl of a food processor fitted with the steel blade, process the cookies, chocolate, brown sugar, and nutmeg into almost finely-ground crumbs. With the machine running, slowly stream the melted butter through the feeder tube and process until the butter is well-incorporated and the crumbs clear the sides of the bowl in a mass form, about 45 seconds to 1 minute. Transfer the crumbs to a 9-inch springform pan and mold them into the pan, starting with the sides of the pan and going up to about ½-inch from the top of the pan then press the crumbs evenly across the bottom of the pan. To make the ganache: Bring the cream to a low simmer in a medium saucepan. Remove from the heat and whisk in the chocolate and Kahlúa until the chocolate is completely melted and the ganache is satiny smooth. Pour 2 cups of the ganache over the bottom of the crust and freeze the springform pan for 30 minutes. Keep the remaining ganache in the pan, covered and at room temperature while you continue with the recipe. To make the filling: Meanwhile, position a rack in the oven to the middle position and preheat the oven to 350° F.
In the bowl of a stand mixer fitted with the paddle attachment, beat the cream cheese and sugar together on medium speed until light and fluffy about 2 minutes, scraping the sides and bottom of the bowl after the first minute. No lumps of cream cheese should remain. Beat in the flour until incorporated. With the mixer on low, stir in the rum, instant espresso powder, vanilla, and molasses. Beat in the eggs one at a time on medium speed, allowing each egg to beat for 1 minute before adding the next. Scrape down the bowl after each addition. 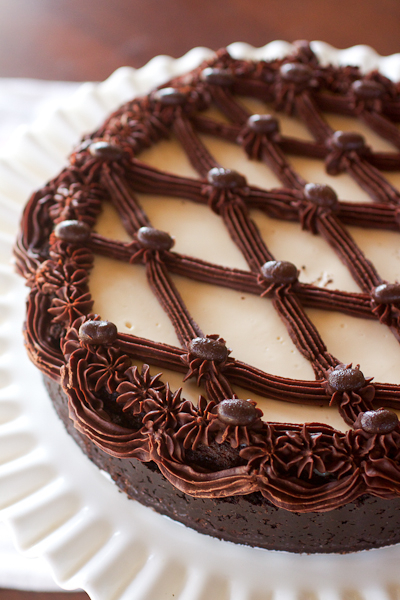 Pour the filling over the cold ganache – don’t worry if the filling overtakes the top of the crust. Bake for 1 hr to 1 hr 30 min. The original recipe says that the cheesecake should bake for 1 hour and 5 minutes but mine was not even close to being finished in that amount of time – I think this was due to the pan still being so cold from freezing the ganache. Start checking the cheesecake after 1 hour and then every 10 minutes thereafter – it will be done when the center of your cheesecake jiggles the slightest bit when the pan is lightly shaken. Remove the cheesecake from the oven and place it on a wire rack to cool for 10 minutes. Leave the oven on at 350° F.
To make the topping: Whisk the sour cream, sugar, and vanilla together in a medium bowl until well combined. Pour the topping over the cheesecake and smooth it out with an offset spatula or wide knife. Bake the cheesecake for another 10 to 15 minutes until the topping is set. Transfer the cheesecake from the oven back to the wire rack to cool for 20 minutes. Make room in your fridge for the cheesecake during this time. Transfer the cheesecake on the rack to the refrigerator to allow the cheesecake to cool for at least 3 hours. To decorate: Once the cheesecake has fully cooled, slide a hot, sharp knife around the crust to loosen it from the springform pan and gently release the sides of the pan. Remove the cheesecake from the pan. The ganache will have hardened during the baking and cooling time. To soften, gently warm it on the stove over low heat, stirring, just until it becomes the consistency of thick frosting then transfer it to the bag and decorate as you wish using a pastry bag fitted with a star tip. 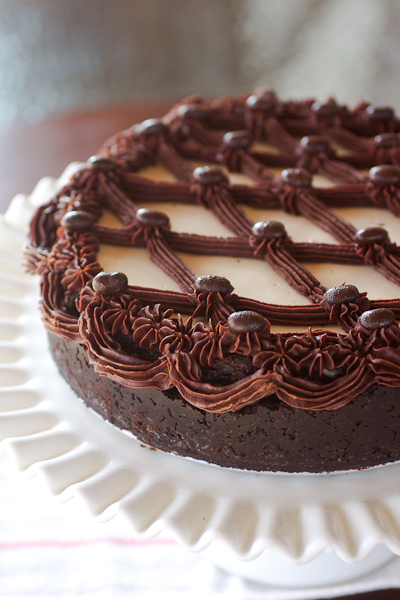 Plunk the chocolate covered espresso beans on top of the ganache decorations to hide any mishaps. Chill the cheesecake for at least 6 hrs or overnight before serving. This is INSANE! I’m crazy about coffee flavored desserts so I’m constantly on the lookout for awesome new ideas. Without a doubt, I’ll be making this. Thanks! One word…gorgeous. Maybe two…looks divine!! I want a piece!! What a gorgeous cheesecake! It would look perfect on a Christmas dessert table! I’m a cheesecake-aholic and that is gorgeous! I made this cheesecake last year – it was a huge hit. Here’s a link to my post if you’re interested.